BUENOS AIRES, Apr 23 2014 (IPS) - At the age of 22, Franco finally landed his first job, although he is not on any payroll and receives no labour benefits. He is part of Argentina’s informal economy, where one out of three workers are employed – a proportion the government aims to reduce by means of a new law. Franco, who asked that his last name not be used, works in a company where 10 percent of the total 150 workers are not on the payroll – most of them young people. “I don’t have any medical coverage, so if something happens to me in the street on the way to work, they won’t assume any responsibility,” Franco, who is also a student, told IPS. “And no contributions are made towards a pension, so this whole year I’ve been working won’t be counted towards my retirement. During the governments of the late Néstor Kirchner (2003-2007) and his successor, President Cristina Fernández, unemployment fell from 17.3 percent in 2003 to 6.4 percent in late 2013. In addition, informal sector employment was reduced from 49.6 to 33.6 percent, according to official figures. But unemployment and precarious employment are still a problem, especially for the young. The Ministry of Labour, Employment and Social Security reports that young people under the age of 24 account for 58.7 percent of precarious employment. “Since a large part of the population does not have access to posts with social protection, workers are forced to accept the labour conditions they are offered,” economist Juan Graña of the Centre of Studies on Population, Employment and Development (CEPED) and author of the book “Salario, calidad de empleo y distribución” (Salary, quality of employment and distribution), told IPS. “Large companies directly put their workers in precarious conditions by means of legal mechanisms, thanks to the reforms of the 1990s, which expanded this kind of work through short-term contracts or trial periods, or by outsourcing part of their processes to small companies,” to cut costs, he added. The manager of a company that sells school supplies told IPS that in small or medium companies like his, the costs of labour and social benefits represent an additional 50 percent on top of the wages paid. “They are very high fixed costs that leave little profit margin, and if the company doesn’t manage to sell, it goes under,” said the executive, who asked to be identified only by his initials, D.G. On Apr. 15, the centre-left government introduced a bill in Congress for the “promotion of registered labour and prevention of labour fraud”. The bill is aimed at regularising the situation of 650,000 workers in the first two years, in order to lower the portion of the workforce active in the informal economy from 33.6 percent to 28 percent. According to President Fernández, precarious and informal labour “is the second-most pressing problem” facing workers in Argentina, after unemployment. The bill would cut employer contributions in half for companies with up to five workers, and would create incentives for putting employees on the payroll, based on the size of the company. Companies with up to 15 workers would not make contributions for new employees in their first year of work, and would only pay 25 percent in the second. Businesses with between 16 and 80 employees would be given a 50 percent discount for 24 months, and those with more than 80 would have a discount of 25 percent for the same period of time. Another central pillar of the reform is a public registry of companies that receive subsidies, credits and tax exemptions from the state. If they commit labour fraud, these benefits would be cancelled, and they would be subject to other penalties as well. In addition, the number of labour inspectors would be increased. The most likely to work in the informal economy are domestics, plumbers, electricians, cleaners, and textile workers, followed by agricultural labourers, construction workers, and hotel and restaurant workers. There are also many freelance professionals and self-employed workers, such as street vendors. 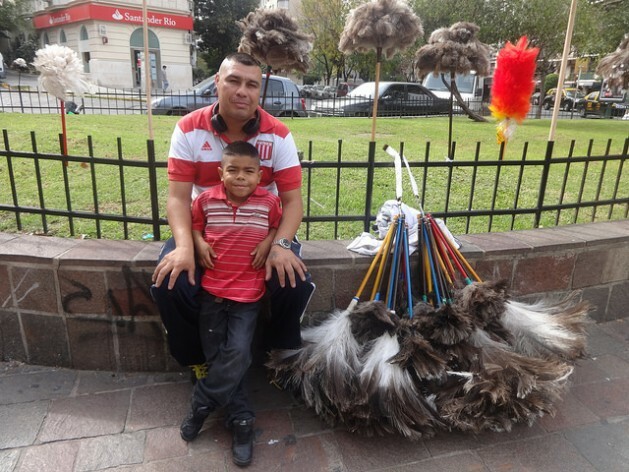 Daniel Reynoso, who has sold feather dusters in Buenos Aires since the age of 12, is one of them. With his work as a street vendor he supports his three children and managed to build a house in a poor suburb of the capital. Although he likes a job where he feels “free,” such as selling feather dusters at a street stall, he laments that he has neither health coverage nor the right to a pension when he retires. “I’m scared for my kids; when something happens to them I have to go to a clinic and pay up front, or to a public hospital,” said Reynoso, who has a feather duster workshop in his house. Moreover, sales are not steady. “When it rains, I don’t go out, and I lose what I would have earned that day,” he told IPS. In the past decade, some six million jobs were created in this country of 42 million. But Fernández admits that precarious working conditions continue to undermine social equality. Graña said, “Precarious workers, who have no institutional coverage, are in poor conditions to improve their working situation and defend their wages,” which are threatened by inflation. And wages are 35 to 50 percent lower than those of employees in the formal sector of the economy. There are factors that influence the precariousness of labour, such as the difficulty to compete faced by companies, which cut labour costs in order to survive, the expert said. “The definitive solution for that is economic development,” he argued. But “in terms of both pay and quality, we are currently far from the levels that we once had in Argentina. The purchasing power of industrial workers is still 27 percent lower than it was in 1974,” Graña said. Ernesto Mattos, an economist at the Centre for Research and Management of the Solidarity Economy (CIGES), underscored advances made in combating informal labour conditions for rural workers and domestics, for example, whose labour rights have been guaranteed by new legislation passed in 2011. Growth of economic activity was the main factor in reducing the informal economy, said Mattos. But in order to continue making progress, labour training is essential “in this stage of capitalism in which technology is important,” he said.